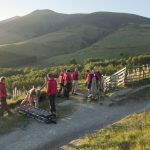 Whilst the Team were out on their regular Thursday practice, they were made aware of an incident at High Crag, Buttermere, where a 50 year old paraglider had crash-landed attempting to take off, damaging an ankle. Cockermouth MRT accepted an offer of assistance as they were very short handed. However, while the Team were in transit, a Coastguard helicopter was tasked to the incident. The Team arrived, but were not required on the hill. They stood by however, until the aircraft had successfully extracted the casualty. He was flown to the Cumberland Infirmary for treatment.